THE NATIONAL STUDENT grant system SUSI has said that a total of 59,000 new applications for third-level grants were received by the deadline at midnight yesterday. The original deadline had been extended due to a technical problem with the student grant website and a spokesperson told TheJournal.ie that most students managed to get their applications in on time with 82,000 applications received, including renewals. These applications will not be processed until after those received before the deadline but many have already been processed by staff at SUSI and delays seen last year are not expected to be repeated. The spokesperson said that “lessons have been learned” from last year when a large number of students were left for months without a decision on their applications. “There’s far less bureaucracy now, applicants used to have to furnish a lot of documents, so arrangements have been made between government agencies to share information so applicants aren’t required to send in as much information,” they said. There had been some complaints about the helpline yesterday but the spokesperson said it was open until midnight and dealt with 550 calls. Applications have slowed down with just 67 sent in since last night and SUSI is expecting about another 6,000 from now. Email “59,000 new grant applications received by SUSI ahead of deadline”. 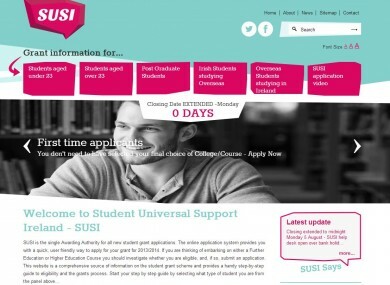 Feedback on “59,000 new grant applications received by SUSI ahead of deadline”.